“Jacques Jansen was a French baryton-martin singer, particularly associated with the role of Pelléas but also active in operetta and on the concert platform, and later as a teacher. Jansen had a wide musical and artistic education; after studying the violin in Paris, he took lessons in solfège and bassoon at the conservatoire in Tours, where he also pursued courses in fine arts. Having taken vocal lessons with Charles Panzéra, from 1938 he studied under Claire Croiza and Georges Viseur (solfège) at the Paris Conservatoire. He also took classes with René Simon and Louis Jouvet and won prizes which might have allowed to followed a career in acting. In 1939 he sang the fountain scene and the tower scene of Claude Debussy's opera PELLÉAS ET MÉLISANDE with the Orchestre National de France under Inghelbrecht, an experience which left him overwhelmed with joy. He made his début as Pelléas at the Grand Théâtre de Genève in 1941. After his Paris début at the Opéra-Comique as Pelléas on 20 April 1941, Jansen also appeared as a singer in Fauré's ‘Masques et bergamasques’ (January 1942), Valérien in ‘Malvina’ (July 1945) and the title rôle in FRAGONARD (February 1946). 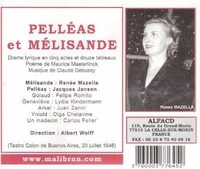 Jansen recorded Pelléas with an Opéra-Comique cast under the conductor Roger Désormière in April and May 1941 with Irène Joachim as Mélisande. This recording is widely considered as a reference recording of this opera. Jansen later recorded the same role under André Cluytens and Inghelbrecht. He also sang the role under Désormière with the Opéra-Comique company at Covent Garden in June 1949, as well as in New York, Brussels, Lisbon, Berlin, Milan, Rome and Tokyo. His last performance was in Tours in March 1971. Although best remembered for the role of Pelléas, Jansen also sang baroque opera: LES INDES GALANTES by Jean-Philippe Rameau; modern opera: CHRISTOPHE COLOMBE by Darius Milhaud and LES CAPRICES DE MARIANNE at the Théâtre des Champs-Élysées in 1956; operetta: THE MERRY WIDOW by Franz Lehár, the première of LA BELLE DE PARIS by Georges Van Parys in 1961, and Antonin in CIBOULETTE in Geneva; and Lieder. Jansen was a magnetic interpreter of Danilo in THE MERRY WIDOW, which he performed some 1,500 times in France, displaying his acting skills, which he also used in several films. He dubbed the singing voice of Alain Cuny in LES VISITEURS DU SOIR (1942). He was for five years professor at the Conservatoire in Marseille, then held a similar post at the Paris Conservatoire, finally teaching vocal technique at the Opéra-Studio. Granddaughter of the great violinist Joseph Joachim, soprano Irène Joachim was a magnificent artist in her own right, beautiful in voice, visage, figure, and musicianship. Although she came to be identified most closely with the role of Mélisande, she was fluent in the German language and mastered not only French mélodie, but also German Lieder. Indeed, Joachim had learned German, while French was but a second language. The care she brought to her enunciation worked in all of her repertory, bringing poignancy and specificity to the operas she essayed and the songs she sang. The daughter of Herman Joachim and Suzanne Chaigneau, a violinist, Joachim was given lessons in the basic elements of music as soon as she was able to grasp the concepts. Violin studies followed at home, as did piano lessons, and the keyboard instrument became her favorite means for music-making until her voice was discovered. By the time she entered the Paris Conservatoire in 1935, Joachim had acquired sufficient musical understanding to provide an advantage in the demanding regimen there. By July 1938, Joachim's end-of-term recital at the Conservatoire attracted the attention of Georges Auric (whose works the singer would come to espouse so eloquently). ‘Recall with me’, Auric wrote in a July 1938 edition of Paris Soir, ‘the name of Mademoiselle Joachim...She impressed us with her enchanting voice, the quality of her style, of her enunciation, her honest and simple expressivity. In future days, Mademoiselle Joachim will be a cherished collaborator of our Opéra-Comique and no musician exists who will decline the pleasure of being in a position to collaborate with her’.